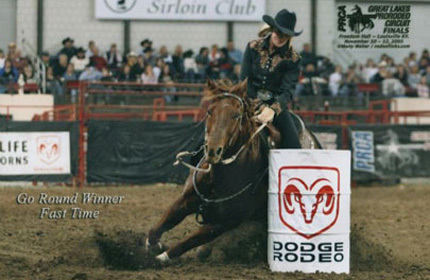 I have been riding since the age of 5 and began barrel racing at 11 yrs old. 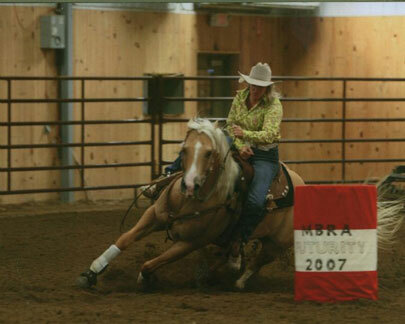 I bought my WPRA card when I was 18 and then started my professional career. Although I have done this for many years, I can say that one of the highlights is seeing the many kids I have mentored through the years go on to amazing careers in riding and within the horse field. My entire family is involved with the rodeo scene and travels together most weekends. I have had success in rodeos, futurity and derby horses. I have won the WPRA Hamel , MN rodeo and my daughter won the novice division. That was one of the most memorable moments for me. I have been blessed with many year-end titles and am working on more in the future. My goals are to continue to produce outstanding barrel horses for my daughter and the public. Thanks to Omega Fields for helping that process! 2011 was wonderful. My two futurity horses ended up 2nd and 4th in the WPRA Futurity standings for 2011. Also they both were in the top of the standing for the NRF. Darlins Feature and Flingn Streaks Ofire were 2nd and 3rd for the year. I have many more coming up behind them for the next year. They were both featured in articles in two well known magazines in our industry this year for their winnings. I cannot express thanks enough for all Omega Fields has done for my program and me these past years. I even had a very well known vet in Oklahoma at the BBR finals ask me this year why my horse had the coat she did. I of course proceeded to rave about the Omega Fields products!! I know the importance of the omegas in one’s diet and therefore am thrilled that I am on track with my horse’s nutrition by being on Omega Fields’ products! It was very obvious in the arena this year. My horses were at peak performance. Thanks again for all you have done for Summer Run Arena Performance Horses!